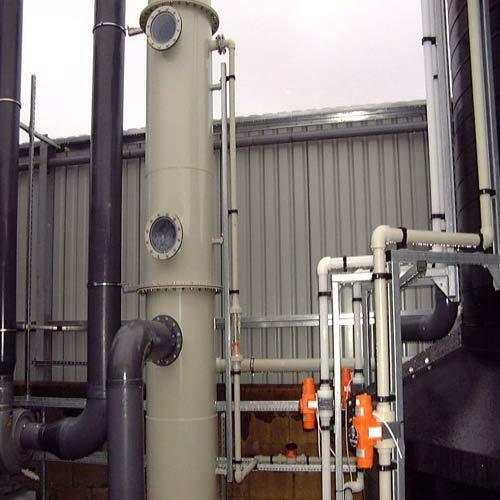 Fume Scrubbers provides local exhaust hood to pick up the toxic and corrosive vapors released during any process operation at source itself is the most efficient and economic method for environmental pollution control in the industrial working areas. The vapors are then canalized through ducts and are scrubbed and neutralized in a scrubber before the air is released to the atmosphere through a blower and stack. The fume extractors are extensively employed in chemical, pharmaceutical, pesticide, caustic soda and chlorine industry, electroplating and galvanizing plants, pickling, passivated and other metallurgical operations. The main advantages are local confinement of the intoxicants, low capital and operating cost and compact in size apart from small area requirements. Envirex has a long-standing experience in design, supply and commissioning of such systems on a turnkey basis after careful study of source location, space availability, ease of operation and the clients requirement..
We provide all above types of scrubbers complete with scrubber tanks, pumps, liquid recirculation system, dosing system, strainers, NRVs, valves, instruments and control system, installation and commissioning at client’s premises. We are one of the leading manufacturers, suppliers and service provider of a wide range of Toxic Gas Cleaning, Scrubbing System and Gas Cooling & Refrigeration System. In addition to this, we specialize in offering Water Treatment.